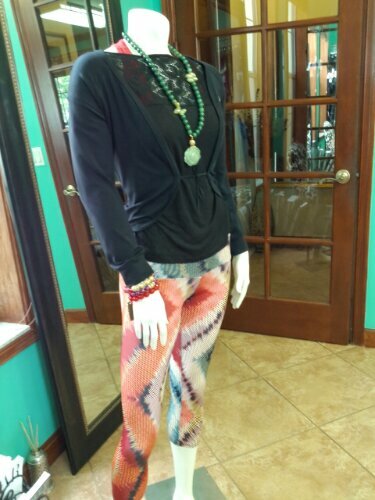 Yesterday, the Palm Beach Athletic Wear blog was all about our mannequin, Monica. Monica wore a look that could carry her throughout her busy day at the gym, to date night with her hubs. Zoe, our Fitness Fashion Stylist, dressed Monica up in a classic, yet funky fitness outfit which showed our readers how to take one look and make it stretch beyond the gym. Today’s Tip Top Tuesday blog post shares how to wear one fitness top and stretch you fitness fashion budget to the max! At just, $36 -10% off and Free US Shipping, you can’t afford NOT to have this beauty in your closet! Want 10% Off your ENTIRE purchase? Use Coupon Code: fireworks to save 10% off your ENTIRE purchase plus, Free US Shipping on every order you place, now through July 7th! Use the coupon code online and in our new fitness fashion boutique. This season, it’s all about lace. But, can you really wear lace to the gym?!?!! Why not?! Palmbeachathleticwear.com offers up a great selection of lace tops and lace blouses that are made specifically with performance fabrics for working out. Even if you never wear the featured lace top to the gym or yoga class, you can be assured that when you sweat in this top (at that dance club you’ve been meaning to go to) this fitness lace top will rock your look! Below, are a few pics of our favorite, feminine lace top by Bluefish Sport. On sale for just, $32.40 with Free US Shipping, adding this fitness top to your workout wardrobe is a no brainer. The above photo at the very top of this blog post, features this same lace top worn backwards. Yes, Zoe did it – She purposely put this Lace Top on Monica backwards to show how versatile this fitness top really is. Zoe proved that with a little creativity and imagination with your fitness fashions, anything is possible! By adding a simple, tie front yoga wrap cardigan and some gorgeous baubles and bling by Angelica Smith Jewelry, this look went from yoga studio guru to glam gorgeous in seconds! A chunky pendant necklace pairs perfectly with Angelica Smith semi precious stone bracelets. ← Monica Monday – What to Wear to Workout AND Date Night?